Most of the time when I receive bento mail, the only one really excited is me. This time, however, two kids immediately claimed the new U-Konserve bento box that arrived yesterday as their own. I will have to order more if they both love this one as much as they claim! My younger son won the turn and immediately went ahead and planned out his lunch. (*if you saw my Facebook post about after school snack yesterday you know that he is very specific about what he would like to have packed). 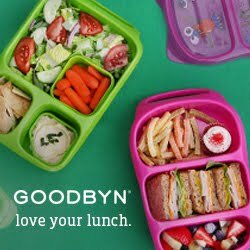 He loved that the lid is clear and his friends will be able to see his cool Darth Vader sandwiches even before he opens his bento box. It will be hard tomorrow morning when the turn to use this box goes to his brother. *The Funkins cloth napkin I used in this post is called Robot Factory. I am excited that limited designs are now availabe for the same price as on the website on Amazon. Cute! Love the box too. The Force is strong in that bento box!